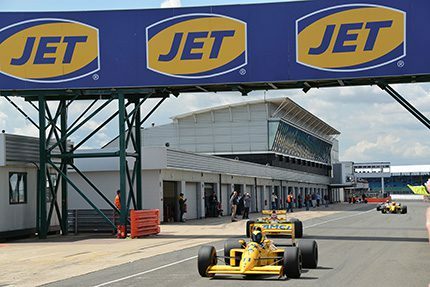 JET put over 70 customers at the heart of all the racing action when they joined the company at the Silverstone Classic in late July; JET has been the festival’s official fuel partner for two years running. “The event was an ideal opportunity for us to thank our customers for their ongoing loyalty, said Mary Wolf, deputy managing director at Phillips 66 UK & Ireland Marketing. “As a brand building exercise, Silverstone Classic is a fantastic way to reach a vast number of car and driving enthusiasts,” said brand communications manager, Anne Day. This year the JET Village Green and Fun Fair attracted high visitor numbers thanks to a wide range of children’s rides and activities, a climbing wall, chill out zones, food and drink options, a hugely popular six track Scalextric challenge and a Formula One simulator. Visitors to JET’s area of the festival also had the chance to take part in two Q&A sessions with the fuel brand’s 2015 ambassador, racing driver Nicolas Hamilton, brother of Lewis Hamilton. Nicolas lives with cerebral palsy and is the first disabled competitor to participate in the Dunlop MSA British Touring Car Championship (BTCC). Nicolas was happy to sign autographs and be pictured alongside his own car, an Audi S3 NGTC with AmD Tuning. “The typical British weather could have put a dampener on the event but thankfully the JET Hub was under cover and provided much-needed shelter for visitors,” added Mary.